It feels like we’re constantly racing against the clock these days - how quickly can we tick off everything on our ‘To Do’ list? Our Inspiring Mum, Roxanne Gately from Glenhaven, Sydney is the founder of Nurture Cards. Whilst sharing her story of how she created her cards and achieved her goals, Roxanne makes a good point that we shouldn’t rush our journey. Although it’s important to have a rough idea of when you would like to achieve your goal by, Roxanne says it’s important “To take each step slowly and be sure that each step is completed before moving on - basically don’t rush into achieving your goal”. This way you can take your time to really think about what you want to achieve and ensure that you take the right steps to get there, rather than running around frantically trying to tick everything off your list. I am a mother of 2. I have created my own unique product / business, Nurture Cards - affirmation cards for children. I have created a box of 40 positive affirmation cards, designed for children, allowing them to create their own inner self-belief, self-love and learn positive self-talk. This is such an important tool for children to develop self-confidence, and shine for who they are as individuals. 2. How did you identify the goals you wanted to achieve? My goals came from my heart. I wanted to provide children with more positive thoughts each day, as well as the chance to be confident and happy within themselves, in world that is moving too fast. I could identify the need as divorce rates climb and I saw some children close to me struggling with this. I could also see the effects of bullying becoming far too common and horrific, as well as such a focus on body image. I hoped to help children become more resilient to negative life issues. There was no deadline for my cards, I knew they would take some time to create and I did not want such an important tool. I looked at what tools I had personally to create them. I had passion for my product, and found that I could create drawings that children would relate to. I researched any competition in this area and found very little, so the demand was there. I connected with parents and child counsellors for advice and suggestions and read a lot of books to help create the right affirmations. I took it step by step and began jotting down the affirmations, then set about drawing the pictures to express the affirmation, after 1-2 years I found I had completed 40 cards that dealt with issues children were facing and needed help with…in between raising my own 2 beautiful girls and creating a happy family. I must say that many things fell into place from there. I found that a mum I knew was a graphic designer, and was able to put my cards onto a program for printing, and before I knew it I had 1000 boxes of Nurture Cards delivered. I feel my main challenge was creating awareness of my new and unique product and how they can actually assist children in so many positive ways. I found that a flyer designed with a paragraph of information was a good way to help with this, and creating a Facebook page allowed me to share a lot of information about my product. I feel that a lack of finances had also been a challenge. I was able to create my product and website , but I had underestimated the cost of advertising my product, and how much advertising was required for a new product. I overcame this to a certain extent by selling wholesale to stores. Oh, and I have also had to face my greatest fear of public speaking! I have been invited to do talks on my cards, and have embraced the opportunity to explain my product benefits of Nurture Cards. That was a huge challenge, but I found when you are sharing something you believe in, it is quite easy to do, after you shake away your nervousness. My absolute passion to help children be happy with who they are. We don’t need a world of children all the same. We are all important just being who we are, and that keeps me going. My children inspire me - all children I see inspire me. I must say the beautiful feedback I receive on my cards certainly inspires me to keep on working hard to get my product ‘out there’. I certainly believe that if you have a passion for something or feel strongly about achieving your goal you will. You may need to face many personal fears, such as failing or even being successful, to have faith in yourself talking with people you may feel are intimidating and so on. To take each step slowly and be sure that each step is completed before moving on - basically don’t rush into achieving your goal. Be confident that YOU can achieve your goal, because you CAN. I have many new goals for Nurture Cards. I am putting them into order as to what I can afford to do, and what I feel is most important. 1) Continue to find stores to sell Nurture Cards. 5) Be on a TV show, sharing my work with everyone. There will always be more goals, and I enjoy the challenges and journeys to complete them. which is Australia's first family friendly radio station. In April, one of our podcasts reached No.1 on iTunes under our category, after only opening our iTunes podcast channel in February! Parents choose PuggleFM. PuggleFM is the trusted podcast hub and online radio station for parents around the world! PuggleFM caters to a new class of parent – and we’re bringing the best of the best news and information directly to you! collection of great content while driving the kids to school, sitting on subways or trains, waiting in line at the bank, while cooking, cleaning, ironing or doing any other of the million jobs we busy parents do each day! Struggle with the commitment of reading the never ending stream of blogs, tweets, posts and email updates, but value the information? Well PuggleFM can help as our podcasts enable you to multitask and get more out of your day! PuggleFM is for busy parents who are sick of sensationalism and scandal seen throughout mainstream media, who crave useful, engaging information without the advertising! We pride ourselves on our commitment to credibility and our dedication to providing the very best for parents around the world! It is hard to establish achievable, valuable goals without first thinking about the bigger picture and your business strategy, and I have always found it extremely beneficial to think about long term and understand your long term goals before you focus on the shorter term. If you aren’t always working towards the “bigger picture” it’s easy to be disheartened when you don’t reach the shorter goals. It’s important that success isn’t about smashing every short term goal out of the water, and never failing to achieve on a day to day basis. In business, success involves a daily grind, and sometimes just keeping your head above water is a goal reached in itself! With PuggleFM, I knew I wanted to provide an alternative media source for parents where they could share important knowledge together as well as have reliable credible access to content with integrity, that wasn’t a discreetly positioned advertisement. When I had my children, I knew I had to at least TRY to make the world a better place, and having well-informed, well-connected parents is a powerful weapon to achieve such change. That has always been my goal. Everything else is steps/pathways in getting there. I haven’t gone down the paths I had originally envisaged; I’ve had to skips steps in some places, and retrace steps in other areas. So long as the general direction is towards the “bigger picture” then I know I’m on the right track. I don’t do plans and deadlines well! That’s not saying I don’t feel they’re important, they’re essential if you’re expecting success, I’m just not very good at achieving them. That’s just the kind of person I am, and it is my blessing as well as my curse. Expanding on what I said previously, I have an end goal and I think about that every day. That is the fuel for my drive and kindles the passion and ensures I battle through the daily grind. Without that end goal, nothing would be worth the effort. However, I know the value of identifying the steps in how you plan to achieve the end goal, and it’s important that you do have a plan on how to achieve the end goal. Just try not to be too strict about it, allowing yourself to bend, adapt and evolve is crucial, and this wisdom has been born from experience. I think it’s important to identify the methods of reaching the end result, and put a rough time schedule against it. Bearing in mind, things take as long as they need to take, there are no shortcuts, and stretching yourself to reach a goal by your original deadline is not always useful. The key is understanding your options, that many pathways that are available to attain the “bigger picture”, continually researching for new ones that might not exist, where they hadn’t before, and always keep an open mind to opportunities, as opportunities present themselves to everyone. Those who find success are the ones open and waiting for these opportunities. It is also important to write yourself weekly and daily goals, to keep your day to day operations on track. At the end of each week analysis them what tasks were achieved and which weren’t and work out why some tasks have been ignored now for weeks. If those “tasks” keep popping up and growing, work out the repercussions of simply not doing them, and if they are bad – use that as your motivation and do them now! If not so bad, then loose them! How much time have you got? I guess the biggest challenge for me, and it literally felt I was being winded by an unknown bully that was beating my hopes and dreams out of me (a tad dramatic, but it’s how I felt and still feel) was the fact that the Australian Government and ACMA refused to grant PuggleFM a radio station license (I applied for FM/AM and digital and LPON) for no real reason. I thought the concept of PuggleFM, which was to improve the continually dropping standards of radio media and to allow parents to come together under one title of being “parents” (instead of minority groups, religions, age, etc) might be a valuable alternative for Australians. I fought that battle for a year and a half, and even took my case to the Commonwealth Ombudsman. (Charlie explains her story here for Today Tonight). I invested heavily into the concept on the hope and passion that this could be valuable for families across Australia, only to be told “no sorry, were keeping these licenses for those who can bid over $2mil – and no more community licenses are available.” That was a sickening blow, and still angers me. However, being extremely stubborn, and still focusing on the “bigger picture” I started the radio station online and have formed an incredible following internationally, and have found great success via iTunes podcasts (thank you Steve Jobs). Without having that focus and drive towards the “bigger picture” or the end goal, it would have been easy for me to throw in the towel when I couldn’t attain a FM transmission license. It’s because I saw that process as a step towards my goal, and not my end goal, was I able to side step and find an alternate pathway. As I have previously stated, my focus on the end goal - what I want to achieve with PuggleFM - is what gives me the drive, passion and energy to get back up after each unsuccessful step up. You just need to look at children when they are learning to walk to get it. They attempt to walk for months before they can. They don’t stop trying just because they didn’t get it the first time. Instead, they’re pulled by this force and know that this is something they will get, and that in their own way, using whatever aids that might assist them, they get there in the end (and usually when the camera has a flat battery and is in the other room). If kids can be that persistent, and believe in their hearts they will achieve, I think, why on earth can’t we? Think very carefully about why you want to achieve your goal, what is the REAL driver behind your motives? What is your REAL motivation? Unlock that knowledge and you have all the passion, desire, energy and stamina you need to achieve the end result. Also define the end result and continually research alterative pathways in achieving the “bigger picture”. Had I not done this, then I might not have come across online radios, or podcasting, or any of the other avenues I have taken in order to reach my end result. Also – if you give up, you didn’t want it bad enough. Those who want things bad enough always reach their end goal, they might have had to take many different paths, bend and break even on the way, but they refocused, regrouped and in the end found their own success. It takes the right motivation and the ability to ride the highs and bounce back from the lows. The end result or bigger picture for me is still unattained but well within my reach. I’m looking at opening up a merchandise wing for PuggleFM that will generate income to supplement our operations of PuggleFM, whilst not compromising our content nor allowing advertising to infiltrate our information. Every day is exciting, presents new challenges, but comes with new rewards. Chasing my dream has been the most rewarding adventures of my life and I encourage all reading to find their dream and chase it for their rest of their days as there is nothing more fulfilling then being free of regret. I quit my job of 14 years as a Midwife to concentrate on my Personal Success coaching business. I also moved from the Central Coast, NSW to Adelaide. As a single mother for 18 years, I hope to help other mums boost their self-esteem and recently created a 60 Day Self-Esteem program. What does your self-esteem look like? Quitting my job is something I have wanted to do for a number of years. Being a coach and all about personal development I regularly write goals. The goal to create a self-esteem program came about from re-assessing the direction my business was heading and discussing it with my own coach. I use and encourage my clients to use a goal book when setting goals. I had an initial plan however it evolved in the time I was developing the program. I started working on it in September and (although a little unrealistic looking back on it) had wanted to get it launched in January. Under estimating the time it would take to get all the components together, which included learning and doing tasks I have never done before in addition to other things I had happening in my life at the time. I have a fantastic group of friends and mentors that encourage and support me. I also figure if I am going to encourage others to take chances and get uncomfortable than I need to be doing the same myself. Write the goal down, make them SMART! Specific, Measureable, Achievable, Realistic and Timely. Put them in a book and add pictures. Make the program into a web-based program rather than an email based one and to make it into an affiliate product. Present a webinar or live workshop on self-esteem. Connect with Jo on facebook on her business page or on the 60 Day Self Esteem Challenge page. “I can’t tell you how many times I sat staring at the phone with my fingers hovering over the buttons, but when I put it into perspective and thought of how many more people I could help by spreading the word the decision to call editors became easy,” says Lisa Grech as she recalls her experience of creating a charity event to support her local community. At the beginning of this year I felt an intense yearning to give back to my community in some way. I own an online baby gift store - Little Grasshopper (www.littlegrasshopper.com.au) and as I am passionate about all things baby I decided to set a goal of creating my own charity event in support of a local community organisation that supports mothers and babies in crisis. Hence Little Grasshopper's 'Baby and Kids Gear Op Swap' parties were born! 2. How did you work towards achieving your goal – did you have a plan and a deadline to achieve your goals? I knew that I wanted to help my chosen organisation before the cold Canberra winter, so had to move quickly. I have been incredibly lucky to have had the support of some marvellous people who gave up their time for me in the process. Being my first attempt at organising an event of this scale I really needed it! Since hatching the idea I have put a lot of thought and effort into the planning and submitted a press release to the local media. I now have many families on board to hold their own parties for May and June this year. I'm really proud of this achievement and hope it will help as many families as possible. 3. What was the biggest challenge you encountered along the way? My original plan was to simply hold my own op swap party, with the remainder of the clothing and blankets going to Karinya House (my chosen organisation). The idea quickly grew and I soon realised that I was going to have to dream bigger if I wanted to help them as much as I could before winter. The thought of going to the press was extremely daunting to me and admittedly one of my biggest hurdles. I can’t tell you how many times I sat staring at the phone with my fingers hovering over the buttons, but when I put it into perspective and thought of how many more people I could help by spreading the word the decision to call editors became easy. They were all so lovely and willing to help that I was so pleased I had called them. I was also proud of myself for having done it – I spent lots of time rehearsing what I was going to say so as to not wreck my chances! 4. What inspires you and keeps you going when you encounter obstacles? The thought of people suffering unnecessarily pains me and although I’m not saving the world with one sweep of the hand I feel that every little bit helps. When I feel discouraged by obstacles I remember to be grateful for the smallest of things in my life, look at the bigger picture, search for another way to get there and remember what the final outcome will be. I actually visualise myself reaching the goal and how I will feel – that seems to help! 5. What advice do you have for anyone wanting to achieve a goal? Don’t be afraid to ask for help! Use all the avenues available to you to find the right people to support you in realising your goals. 6. What are the next goals you hope to achieve? Giving back to my community is something I am passionate about now – especially after having a child. I’m always dreaming up ways I can help, so I dare say my next goal will be to support another community organisation in need. When was the last time you were let down by a pen that wouldn’t work? Perhaps you were frantically trying to write on the high-gloss surface of a birthday or anniversary card at the last minute, or trying to write on a surface that (accidently) had a bit of grease on it, or (slightly less likely) trying to write in space. Whatever you’re writing on, you want to be confident that your message will get across loud and clear. A pen that works when you need it to is an essential item for any briefcase, handbag or car glove box. 1. It’s designed to perform in harsh conditions – Space Pen designer Paul Fisher was inspired by space exploration and created a pen that withstands extreme temperatures and conditions. 2. NASA has thoroughly tested the design of the Space Pen and it is still used on manned flights to space today. 3. It’s compact – The sleek, minimalistic design is ideal for anywhere – your wallet, purse, pocket, the car or even your toolbox. and of course...in the gravity free vacuum of outer-space. - The Fisher Space Pen was first patented in 1965. Following a couple of years of NASA testing, the pen was then used on Apollo 7 in 1968. - A special Fisher Space Pen called the Stowaway was created in 1985 from genuine gold recovered from the 1622 Spanish Galleon - Nuestra Señora de Atocha treasure. - In 1998, a Seinfeld episode was dedicated to the Fisher Space Pen. Seinfeld accepts a Space Pen from his neighbour, which his parents are not impressed about. - Also in 1998, the Space Pen was also used to write the words “QVV” (for QVC Shopping Network) on the Russian Space Station Mir - so it became the first product sold in space. SPECIAL OFFER: Receive FREE DELIVERY on all orders containing a Fisher Space Pen placed before 5pm Tues 28/5/2013. Simply enter Coupon Code FISHER when you checkout. As a career focused, hardworking 20-something banker in London, I thought nothing of the fact that I was pregnant and worked right up until 40 weeks. Yes, I literally finished a conference call with the CFO of EMEA as I popped into the maternity unit and had my baby. Up until that point, the thought of NOT returning to work was out of the question. Why WOULDN’T I want to go back to my well-paying, highly demanding job at RBS? Surely I could blackberry AND breastfeed simultaneously? How hard could this baby stuff really be? Well, rumour has it that having a baby is life-changing, and that I can now vouch for. The moment I returned home with a bundle in my arms, the thought of returning to work was NOT an option. It was out of the question. I didn’t want to be away from my baby for even a micro-second. Time went by and before I knew it, a year had passed. In that space we had moved back to Sydney and I started thinking about returning to work. I had always loved working but the sad reality was I could not fathom returning to banking. That type of career does not cater well to the stay-at-home mum. It was at this point, as I was hanging washing on the line, the idea of Attipas Australia was born. A pair of shoes that I had casually purchased in Japan on a holiday had become the talk of the town. These shoe-socks, as I coined them, were unlike anything on the Australian market. Mothers were particularly in awe of how well my 14 month old was walking in them. I would start importing and selling those very shoes.As a banker in London, I had little knowledge of the retail market aside from fluttering away my hard-earned cash on shoes during lunch time. But my career HAD taught me to be confident, perseverant, and most importantly, had given me that ‘Fake it ‘til you make it’ attitude (a necessity when one is blonde in a male dominated industry). So I bit the bullet and emailed the manufacturer. Within a day I had a response. No, they did not have an exclusive distributor for Australia as yet, and yes, they were interested in working with me so long as I could meet their buying criteria. A quick call to the bank and a few minor tweaks to some numbers and I was certain we could do it. Within a week, I had signed the exclusive distribution agreement and we were up. Or so I thought. My to do list was now reading like a mini novel and not even close to the finale. A business plan, a business name, a bank account, shippers, a warehouse, a fulfilment centre. To name but a few. Sheer excitement kept the momentum going but I still had one very demanding one year old to look after. And THAT workload certainly wasn’t lessoning. Drawing upon my banking experience, I again discovered the key to success is outsourcing. And outsource I did. I outsourced babysitting to family, graphic design work to Pakistan and web development to India. I approached old colleagues to do photo shoots and friends for PR. I even had the local Australia Post team running around for me, knowing I was a local mum with a very small car and yet a very big business idea. Time went by and I gradually I took the role of a ‘mumpreneur’ into my stride. It has been a hard slog, considering being a mum alone is difficult enough. On average I now work 6-8 hours a day, on top of minding a toddler. But with passion, enthusiasm, and a loving family, I have been able to achieve my dream. Our first batch of functional toddler shoes are now available online via (www.attipas.com.au). I now wake up in the morning and am driven by passion, rather than caffeine, blackberry messenger and a daily rate. Life is good. My true goals are still a work in progress, however from the beginning I knew that I wanted my business to be a success. Success can be measured in many ways and is different for every person. As a ‘mumpreneuer’, success is measured by the ability to run a profitable, long-lasting business, as well as finding a balance with my family life. I didn’t have a plan per say; just an idea in my mind. I am still working towards achieving profitability (though having been operating only 6 months, our figures show we are on the right track). In terms of maintaining a balanced work and family life, this is something I am still working on but can definitely say that time with my son is never jeopardised, and it is only my personal time that gives way to work. Running your own business is a fulltime job, as is being a mum, so having two fulltime jobs is rather challenging! Having said that, I have slowly managed to find balance between the both. I also have had negative encounters along the way with dishonest contractors, but am better at learning how to trust people. When I encounter obstacles such as knockbacks, or a slow week, I try and not left self-doubt get the better of me. I have always been a high achiever and know that self-doubt is your biggest enemy. On ‘off’ days, I reassure myself of my successes to date, which gives me the confidence to keep going. Put your mind to it and you will achieve it. Don’t let anyone tell you otherwise. They do not know you like you do. Write a detailed plan, but don’t be afraid to deviate if required. Listen to knowledgeable mentors and utilise advice wisely. Don’t less self-doubt get the better of you, and most of all, be patient. Most successful entrepreneurs are years in the making. After Attipas toddler shoes become more known and business starts to take care of itself, my next goal is a sister site called ‘Things 4 Bubs’, which will showcase new and unique products from around the world. Caroline lives in Paddington, NSW, with her husband John and son Henry (2 years, the face of Attipas baby shoes online). 1. Which organisation do you volunteer for and why? Down Syndrome Victoria - my brother has Down Syndrome so this gives me the opportunity to help an organisation that has helped my family over time. Down Syndrome is something I am very passionate about and therefore I enjoy giving back to this organisation. Red Cross blood donation - because it doesn't take long to do and if it means helping someone who urgently needs blood then it must be a good thing. 2. How long have you volunteered for? What attracted you to volunteering and what has kept you coming back? I started volunteering in 2008 and have done it for various organisations on and off ever since. 3. Describe your volunteer role and what you do each time you help out - do you do the same thing each time you volunteer, or something different each time? Melbourne CityMission - I take people with disabilities out to the movies and for coffee each month. Down Syndrome Victoria - I usually help out in the office and do administration tasks. I also assist with events when they are on. 4. What advice would you offer to other people considering volunteering? About Harriet Kempton: Harriet has recently set up her own new blog and business, "Queen Kempton". Owner & Creative Director, Harriet Kempton is a 24 year-old with a passion for making life fun and fabulous. This is combined with a strong work ethic, motivation and the determination to deliver quality information in an accessible manner. A specialist in work-life balance and Generation Y, Queen Kempton’s focus is on helping employees achieve their ideal work-life balance and helping school and university leavers with decisions post study. Harriet writes weekly tips on her blog about work-life balance and the transition stage and will come to your school/university/organisation to deliver a specified presentation that is relevant to the audience. I’m a 34 year old mother of two little girls (Tilly, 4 and Poppy 2) and am expecting my third baby in September this year. With a background in sales, marketing and health, and a passion for gorgeous earth-friendly products, I created an online shopping spot for earthy souls. Tree Hugga offers earthy souls a gorgeous eco-friendly online shopping spot and an active social hub to share, learn and purchase natural alternatives to mass produced products. Having variations of the idea in my head for many years, it took going back to work full-time to realise that I needed to make my dream happen. Working full time with my two little girls still at home did not work for our little family. I love gorgeous things and if they have an earthy or eco edge I love them even more, so I wanted to create a modern earthy marketplace for the new age greenies like myself! Having many ideas in my head, I continued to have many a brain storming session with my husband, Pete. We then met with some enthusiastic friends of ours to talk through the concept further, both of whom were very excited for us and loved the idea. One of these lovely friends, Lena who is a designer, then came on board to do the design work for me. I think she nailed the brief! As I have a strategic marketing background (and perhaps some would call me overly organised) I had to formalise my ideas and goals for the business. Hence, I compiled a detailed business plan and set my vision, values and strategic goals. This is what I am using to keep myself inspired, motivated and on track. Sometimes it can be easy to forget the direction you initially wanted to see things go, especially when you have two bunnies tugging at your leg! I did set deadlines for various tasks along the way. We pretty much stayed on track launching the website only a few weeks later than we originally anticipated. For me I think the biggest challenge in launching my site has been the actual commitment to investing my family’s money in the project. It’s a risk and that’s scary when you have a young family and another baby on the way. However, now that I have done it and I can see my vision alive and going well, I am totally satisfied and know that if anyone can make this work...I can. Wonder what else I can do too??? Obstacles can be seen as opportunities; to try something different, manage your emotions and grow as an individual. Sometimes in the moment of crisis it’s hard to see this! I actually find it very satisfying when I work towards the solution of a problem. When I see the result or gain some positive feedback, I get excited to continue and feel a real sense of achievement. When I do crack under pressure or self-doubt, usually a good chat with Pete helps shift my mindset. I often also sit back and just look at my website and feel inspired by the fact I actually made it happen! Write it down! I am quite visual so I need to have things written out and stuck on my wall so I can revisit it often. It even allows you to cross of certain goals and add a new angle without forgetting where you started from. The other important thing is to talk to people about it. Many are willing to share their ideas, thoughts and experiences which can be important in helping you make the decision to move forward with your dream! Next on my list is to work towards the positive growth of Tree Hugga. There are so many amazing products out there, I cannot wait to be able to offer more and more of these in the one shopping spot for those who love earthy gorgeous things. And of course, continue to be the best mother I can be to my two little girls and my new arrival in September! Adssi HomeLiving Australia, a not-for-profit organisation providing home care services to frail aged and people with a disability. Through my experience as a carer for both my parents, I developed a strong understanding of the isolation that can occur for people as they age. I also experienced the challenges faced by carers.I volunteer with them because I strongly believe it’s important to help people stay living in their own home, primarily frail aged and people with a disability. This enables them to retain their sense of community and independence which can be lost if you move into residential care. I’ve been volunteering for over 2 years and I continue to do it because I get to see the difference myself and other volunteers make in the day to day lives of our clients. I have various responsibilities including administration, customer service, accompanying clients on social outings and the Safe Access and Eco Garden (SAEG) project. The SAEG project transforms clients gardens to make them safer (reducing falls risks etc) and more manageable, lower maintenance and generally more accessible, reducing a lot of worry for our clients. Just do it! Even a few hours a week can make a difference in someone’s life. There are so many ways you can help out by volunteering at Adssi HomeLiving Australia. About Bruce: Before my retirement a few years ago, I worked with the Commonwealth Bank of Australia and the public service. This took me all over New South Wales and I held roles in customer service and administration. Volunteering allows me to keep my mind and body active and allows me to interact with both colleagues and clients, keeping me engaged with my local community. The power of giving is something that should never be underestimated. I’m not just talking about material gifts, I’m referring to something that’s precious to everyone these days – TIME. Between work, family and friends, there never seems to be enough time to go around. Yet, there’s an incredible group of people in our community that never seem to have a shortage of time to dedicate to other community members that need a hand. "I truly believe that the best gift is the one you can give others, and there really is so much to be gained and learned from sharing our time and skills with others." 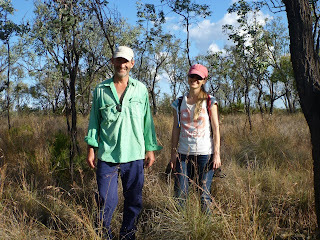 Bryan West, volunteer for Bush Heritage Australia. 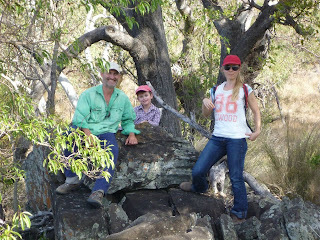 My family and I are currently volunteers at Bush Heritage Australia's Carnarvon Station Reserve. It is about a 3 hour (dry weather only) drive to the nearest town of Augathella in western Queensland. We decided to offer a year to Bush Heritage because the great conservation work that they had been doing was severely hampered by two years of substantial flooding which made the property inaccessible. come from serving something larger than our own immediate needs. At the same time, I am taking advantage of the UN Online Volunteers portal to do some volunteer work for other organisations. At the moment I am developing a website to enable a Nicaraguan girls' craft cooperative to be able to sell their goods to a global market. I can remember volunteering for things as a child. More recently, we have been here since January, and are already feeling a bit sad about having to leave at the end of the year! I think the reason we keep doing things like this is simply because of the thing called 'The Gift of Giving' - I truly believe that the best gift is the one you can give others, and there really is so much to be gained and learned from sharing our time and skills with others. At the moment, we are heavily involved in conservation related activities at Carnarvon Station. 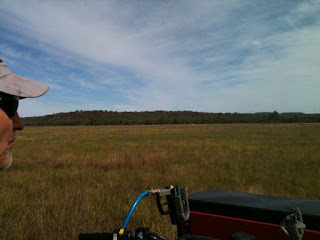 This includes weed mapping and spraying, feral animal control as well as a broad range of maintenance activities related to the buildings, vehicles, roads and fences. In general terms, our volunteering activities are many and varied. Try to be clear about what you want to get out of it, so that you don't end up feeling a bit ripped off or used. Remember that ultimately it is about relationships, so tread softly with other people. If you are not sure, then ask!